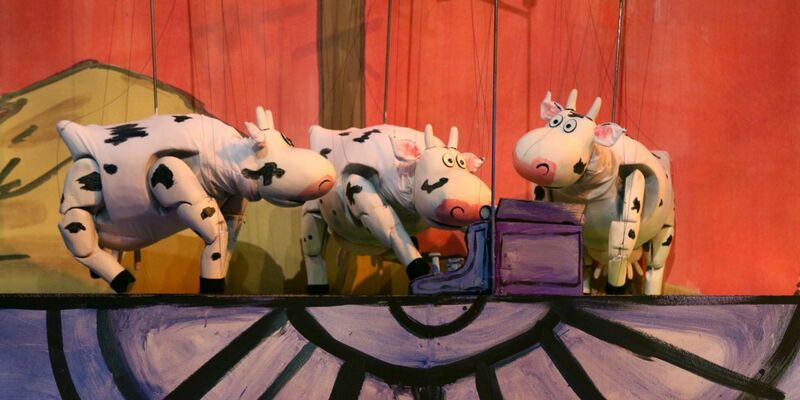 Visit Center for Puppetry Arts to see “Click, Clack, Moo: Cows That Type.” Photo courtesy of Center for Puppetry Arts. There are several events this weekend in Atlanta that will allow visitors to see stories or venues in a new light through unique and imaginative programming. There’s a book made into a play, “Click, Clack, Moo: Cows That Type,” at Center for Puppetry Arts. And a hit show, “The Handmaid’s Tale,” on view as an exhibit at SCAD FASH Museum of Fashion + Film. Two higher education venues offer atypical events for the public — a free screening of “The Greatest Showman” at Georgia Tech and a night run/music festival at Georgia State’s Stadium. Atlanta Shortsfest at Synchronicity Theatre offers two days of short films where live theater usually abounds. Finally Sundays on the River brings a live concert to the Chattahoochee Nature Center. Have fun finding new experiences in Atlanta this weekend! When: July 7 from 8:30 to 11 p.m.
What to Expect: The Night Nation Run is the World’s first Running Music Festival, an ultimate blend of a music festival and a fun run. Experience a music-filled course with live DJs, bubble zones, light shows, neon and black lights. At the finish line find a party with music from top DJs. The gates open at 5:30 p.m. for registration and a pre-race party. When: Through July 29: Tuesday through Friday at 10 a.m. and noon, Saturday at 11 a.m. and 1 p.m., Sunday at 1 and 3 p.m.
What to Expect: Cows that type? Chickens on strike? Farmer Brown can’t believe his ears! Join the barnyard fun in this adaptation of the award-winning children’s book. 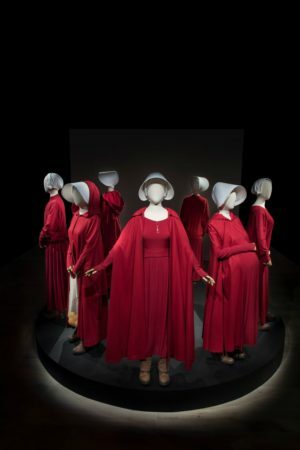 See costumes from the hit show “The Handmaid’s Tale” at SCAD FASH Museum of Fashion + Film. Photo courtesy of Savannah College of Art and Design. When: July 8 from 6 to 9 p.m.
What to Expect: Whether it’s a girl’s night, date night, or a you night, nature provides the perfect backdrop for this concert by Adron, who playfully blends Brazilian samba, Bossa Nova and Tropicalia. Doors open at 6 p.m., and the concert is from 7 to 9 p.m. Bring a picnic dinner! A cash bar is available. When: Through Aug. 12: Tuesday, Wednesday, Friday and Saturday from 10 a.m. to 5 p.m., Thursday from 10 a.m. to 8 p.m., Sunday from 12 to 5 p.m.
What to Expect: Love “The Handmaid’s Tale?” See some original garments designed by Ane Crabtree from the Emmy- and Golden Globe-winning show up close and in person. What to Expect: The 8th annual Atlanta Shortsfest features a series of films running under 45 minutes in various genres, including animation, drama, horror, comedy, LGBTQ shorts and more. Pick some films from the schedule, or get a one- or two-day pass to see several. When: July 6 at 8 p.m.
What to Expect: Weather permitting, enjoy an outdoor screening of “The Greatest Showman” in Midtown at Georgia Tech. Don’t forget a blanket to sit on!